While the EU destinations remain on the top of the Chinese travellers’ wish lists, the Chinese market only represents 2% of the total international arrivals recorded in the EU. More attention needs to be paid to the growing importance of China as an origin market as well as the changing preferences and behaviour patterns of Chinese visitors. "Ready for China" includes market reports, practical tips on doing business in China, promotional materials, legal information and many other resources to help every segment of the travel industry to attract and welcome Chinese travellers. You can also upload your resources to share expertise and experience with all. What follows is a fraction of what registered and logged-in users have access to. Please register or login to access it. If you have contents that you would like to share please submit all details related in order for it to be displayed here. 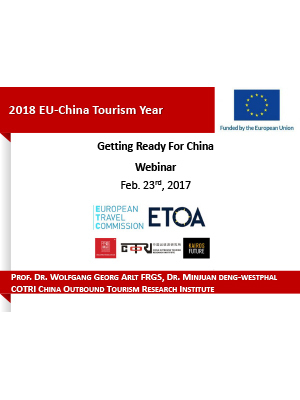 “Ready for China” include market reports, practical tips on doing business in China, promotional materials, legal information and many other resources to help every segment of the travel industry to attract and welcome Chinese travellers better. You can also upload your resources to share expertise and experience with all. If your organisation has content that you would like to share please submit all details related in order for it to be displayed here. SCHENGEN STATES ISSUED 2.1 MILLION VISAS FOR CHINESE TOURISTS IN 2016. THE NUMBER OF NIGHTS SPENT IN THE EU BY TOURISTS FROM CHINA MORE THAN TRIPLED OVER THE LAST TEN YEARS, TO REACH NEARLY 25 MILLION NIGHTS IN 2016. CHINA MADE THE SECOND LARGEST CONTRIBUTION (15%) TO THE OVERNIGHTS GROWTH IN THE EU IN 2015, 2016 AND 2017. THE POSITIVE TREND IS EXPECTED TO CONTINUE TOWARDS 2020. THE CHINESE EXPENDITURE ON TRAVEL SERVICES IN THE EU ARE EXPECTED TO INCREASE BY EUR 3 BILLION UNTIL 2020 - AN AVERAGE YEAR OVER YEAR GROWTH OF 10% SINCE 2016. THE EUROPEAN UNION ISSUED MORE THAN 2.4 MILLION SCHENGEN VISAS FOR CHINESE CITIZENS IN 2017. TOURISTS FROM CHINA ACCOUNT FOR ALMOST 6% OF THE TOTAL NUMBER OF NIGHTS SPENT IN THE EU BY NON-EU NATIONALS. CHINESE TRIPS TO THE EU SCHENGEN AREA ARE EXPECTED TO INCREASE BY 1.5 MILLION TRIPS UNTIL 2020 - A YEAR OVER YEAR GROWTH OF 10% SINCE 2016. This section provides practical information for European tourism SMEs on how to do business with Chinese. Readers can find information on aspects, such as general profile of the country, background economic and legislative information, nature of outbound holidays, structure of the travel trade and recommendations for European tourism suppliers. EC - How can I attract tourists from China? This section consists of various publications providing a comprehensive information about the Chinese Outbound Travel Market. Readers can find information on the portrait of different travel segments, tourists’ expectations and behaviours as well as to learn about the current and prospective travel trends in this market.